Game Formats on GameBook, part 2 – Let’s team up! In addition to the individually played classic game formats (introduced in part one of this series) GameBook also offers a variety of game formats for teams. While golf is an individual sport – without a question – golf is also very social. And every once in a while it’s good to have somebody else to blame than yourself and the equipment. So get your friends together and team up to face your opponents! Scramble is an all-time favorite for team golf outings. Each player in a group tees off on a hole. After each shot, the best shot is selected and all players play the next shot from that spot, until the ball is holed. One team score is recorded. With GameBook, you can play scramble with groups of two, three or four players. If you’re going to play with a four-some, try a two-person scramble match. Better Ball is defitenetely one of the most popular team games in golf. It is a two-person Best Ball (also known as Four Ball), where each player plays his or her own ball throughout the round, and on each hole the better score serves as the team score. If you’re going to play with a four-some, try a Better Ball match! In Best Ball, each player plays his or her own ball throughout the round, and on each hole 1 or 2 best scores serve as the team score. 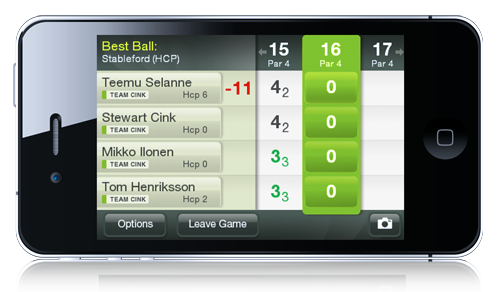 With GameBook, you can play Best Ball with groups of three or four players. Ready to rumble? GameBook has a four-person Irish Rumble available. It is a Best Ball format played with Stableford points where the best single score is recorded for the first six holes (1-6); the best two scores are recorded for the next six holes (7-12); the best three scores are recorded on the next five holes (13-17); and on the last hole (18), all four scores are recorded for the team. GameBook calculates scoring for you automatically so you can try it out without being a math genius! Next time we’ll have a closer look at GameBook’s own game formats Duplicate and Erado. Handicaps in UK for 2 and 4 ball better ball match play, are all and 3/4 difference (respectively) from lowest handicap ! As you might know we don’t support the match-play format just yet. But you can adjust the handicap percentages each time you select a game format like Better Ball and after that the app will ask you the HCP percentage, here add 75%. Unfortunately we don’t support Eclectic-format at the moment. There are other users as well hoping for this to be added and you can vote for the idea at our Support Center’s Game Formats-forum. The forum helps us to figure out which ideas to bring out next, and to see what features are the most popular among the users. Why doesn’t the app support Ryder cup formats? Limited to five members per team (which is equivalent to a max tee spot). How do you enable a group of six per team for instance? I remember this in older versions, but can’t see it here. At the moment the Matchplay-format is under development and we will launch the Ryder Cup -format at some point as well, but currently we are focusing on the development of Matchplay. In the game creation you can have maximum of 5 players in one group. If you are playing 6 against 6 players, you can solve it by having the players playing 2 versus 2 in groups of 4 (2vs2, 2vs2 and 2vs2) and then manually calculate the scores. When is AppleWatch app coming? Can the best ball / better ball games be played with net scores? Thank you for the comment and suggestion! Yes, best ball and better ball games can be played with net scores. You can turn the handicaps off from the game settings. How do you calculate the playing hcp of a 4 man scramble? Is there a way to take combined scores of two-man teams and to compete against other two-man teams in the field?